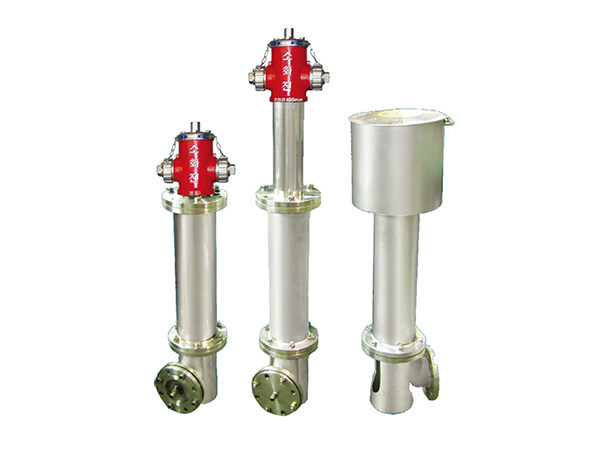 Established in 1996, Chungwon has been specialized in developing and releasing a special purpose of fire hydrant aimed to prevent safety-related accidents that could harm ordinary citizens. Placed underground, the world’s first underground-laid fire hydrant can effectively perform its originally planned performance without causing any safety-related accidents that could endanger pedestrians. (STS304) and thus there is no possibility of oxidation and corrosion. Employing a relief valve, if necessary, it completely drains out the water(for extinguishing fires) within the fire hydrant so that the possible occurrence of water pollution and soil pollution is considerably decreased. The operator can enjoy convenience in maintenance as it is not exposed to theft or breakdown. It has no limitation in installation position with easy installation. The stainless is applied in its manufacturing process thus offering a semipermanent lifespan, compared to other existing similar ones. As the operations of assembly and disassembly are easy, the operators can thus easily exchange the parts conveniently. Potential export destinations for this year include Japan, etc.